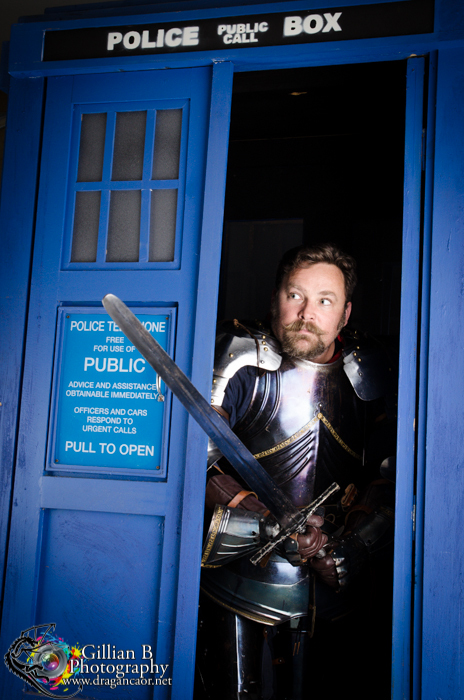 Want your photograph taken with that famous blue box? Don’t want to go all the way to Cardiff? 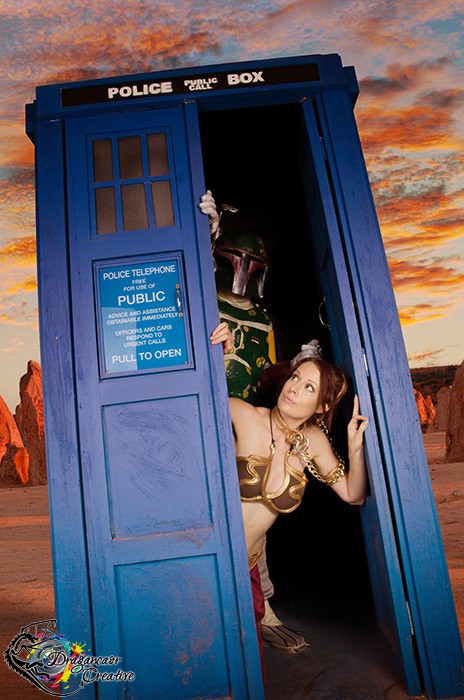 I’ve been offering TARDIS photoshoots since July 2012, but now they’re even better than ever! Now you can choose between posing alone, with a Doctor*, with a Companion, with a “monster,” or even with a character from an entirely different Sci Fi, in a full sized, complete, 4th Doctor era replica TARDIS. Use our props*, or bring your own! Keep it serious or have fun with crossovers! Come & work with someone who lives & breathes Doctor Who. Some who fell in love with the show back when the 5th Doctor was on the job. Someone who is a fan. Someone who is a geek. Finish up with amazing photos that you can display with pride! Leave our studio with a smile, a belly full of good Tea, & fond memories. Deposit of $200 to be paid on booking. Deposit of $250 to be paid on booking. SPFX Makeup: Contact me for a quote. Matted Prints from $50 each. Choose from 5×7” or 8×10” prints. The Doctor, companions, monsters & cross over characters are not the BBC actors. It would be a bit hard to get William Hartnell to come & pose for you (because Ethics! ), but we’ve organised for some of Perth’s very talented costumers (including Costumes by Courtney & Lady Jaded) to take on the roles. 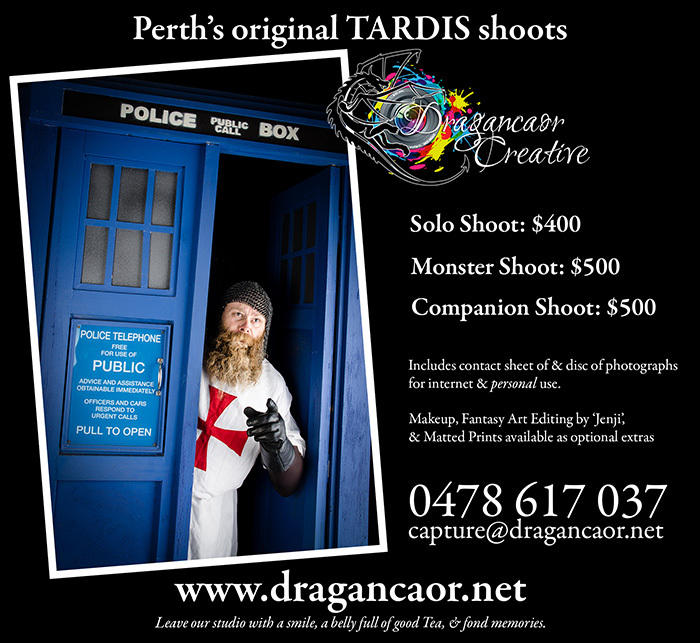 Multiple character shoots are priced based on how many actors you need – If you want the Doctor & Amy, your shoot would be $600, while having a single Doctor would be $500. Deposits secure your booking, price & date. They are non refundable, but why would you cancel something as awesome as this anyway? If you would like Princess Leia, Catwoman, or another unrelated character, please contact me with who you were hoping for & I will let you know if one of our actors can do it.